THE Lombard plan is well suited for skinny lots. Being only 15' wide, it can gracefully squeeze onto an infill lot and still blend into your 1910's neighborhood. The lines are reminiscient of a Victorian home - the amount of detail added all depends on your taste for gingerbread. Personally, we like spice, but since you may not we won't overwhelm you with its presence. The full front porch is deep enough to lounge on and enjoy a warm summer day. It's even big enough for a hammock if you swing that way. The parlor is spacious and includes a nice little throwback - an inglenook! We're not quite sure why it's named as such, but you can ingle there as long as you like. The fireplace is a built-in unit, venting out the side of the house. The chimney is completely false, but is added for character. We'll readdress it upstairs. The dining room has a faux dropped beam ceiling and we've worked an inset bay for charm. We also envision wood panel wainscoting with a nice chair rail. Perhaps some crown molding or picture rail? The kitchen is very functional, and when you need a table for one you can slip into the diner style eating booth. Upstairs we have brought some semblence of the modern with a vaulted master suite. Remember the false chimney from downstairs? It makes such a great little nook to slide the loo into. A pocket laundry room on the second floor is highly convenient to the bedrooms. Two more bedrooms and a bath round out the rest of the upstairs. 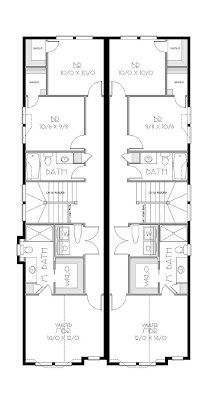 At 1669 square feet, this makes an ideal starter home. 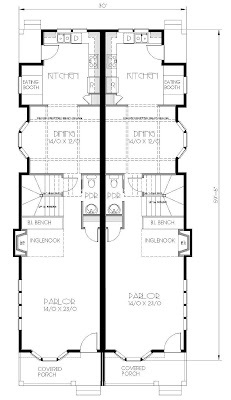 This plan is available as a single wide. We originally fabricated this as a single dwelling for narrow lots. Check it out, you just might like it.